Mountain Project just released its “School of Rock” pages, an entire section of the website dedicated to instructional content to learn to climb. It’s hard to make an argument that this is any different than Freedom of the Hills and Learning to Rock Climb, only in an electronic form. Maybe that’s better, as it is more accessible to more folks, especially ambitious but moronic teenagers (i.e. ones like me at fourteen). As tempting as it is to use my time to critique, on both technical and philosophical levels, the problems with this pseudo-democratic, erroneously constructivist attempt at distributing discrete knowledge, I’m not going to. I’ll just say, buyer beware (it’s free). There’s a section on traditional climbing, which is, disappointingly, not very funny, even in an ironic way. Admittedly, I haven’t scoured the whole section, so maybe there are some gems in there somewhere. I also can’t vouch for accuracy and exact content, but I would bet my #7 stopper (which is my lucky one, for reference) that it isn’t a whole lot different than the other tomes of climbing’s technical skills. I’ve come to believe that all of these instructional manuals are missing some important aspects of being a successful traditional rock climber, and I’m here today to give them to you: the finer points of traditional rock climbing. Note: Some of these may not be specific to trad climbing and could be applied to various other forms of our sport. Use your partner’s name with commands, like “Belay off, Hans.” Unless you’re alone on a wall in an unexplored region of Baffin Island, there’s a very good chance someone else will be climbing nearby. Hearing their name also helps wake up your partner as they nod off from low blood sugar. Don’t say “I’m off” when you fall. Say “falling” or nothing at all. Usually, your belay knows what’s happening. 150 feet up a windy, hard-to-see pitch, “I’m off” could get confusing and even catastrophic. Place bomber gear, and as best you can, place gear that your partner can get out, you tiny-handed people. Everyone hears about extending slings on pieces to minimize rope drag, which is a good idea, but the seasoned trad climber eyes a pitch from the belay and plans ahead for the parts that will need slings. Generally, it’s mentally easier to sling pro long at the bottom of a pitch (hard moves above ledges aside), when we’re fresh and confident, than at the top. A rope that innocently runs over a small rooflet down low can become a Titanic of drag at the top. * This is, of course, assuming you don’t certainly know you need that given piece up higher. In that case, place the best you can get otherwise, then keep your wits about you until you get the good one in. Almost all the time, do the shorter rappel. Also, knots in the end are a great idea, but it can be even better to clip the ends of the rope(s) to your harness rather than throw them down to get them stuck in a crack. Get over yourself and let faster parties pass. Sure, it’s cold and you’re already on track to get benighted; these are minor penalties for being slow. It’s unlikely that those will change much if you let the party blasting up the route behind you go by. Just humbly smile, and let their prowess be an inspiration to not get benighted the next time. If you’re going to bail and there’s a party close behind, let them climb through, then bail. Just like on trails, uphill travel gets the right-of-way. Things like puffy jackets, extra water, real food (instead of bars and gels), a lightweight tarp big enough to wrap around your legs, and gloves can make a long day up a hard route way more fun. And if the route is steep and clean enough, hauling the bag instead of climbing with it can further increase the fun quotient. Climbing in a team three on big routes can also be super fun. There are several strategies to minimize the extra time involved with three climbers, making the added social atmosphere totally worth it. Get good at placing passive pro. When placed well, they’re stronger than cams, but they are a little more nuanced. Placing them efficiently will help you send. Put yourself in situations in which you can practice falling on gear. Climbing manufacturing isn’t a multi-billion dollar industry to make shiny training weight. Those widgets work! Start small and conservatively, but place good gear (back it up if you must) and fall on it. At some point, trying to redpoint challenging trad climbs will probably be part of the progression. There’s a fine line between running it out to move quickly and placing enough gear to climb confidently. If you’re gripped, you won’t climb well. And finally, for God’s sake, double check the basics – harness, knot, and belay – before you leave the ground. I’ve seen too many folks get fixated on making sure they have 17 hand-sized cams organized perfectly on their gear loops but neglect to check the buckle. Don’t lose sight of the most important parts of the system. On the note of advice: if someone recommends a trad route, but hasn’t climbed it, don’t listen to them. You just might end up on the Narrows pitch of the Steck-Salathe. 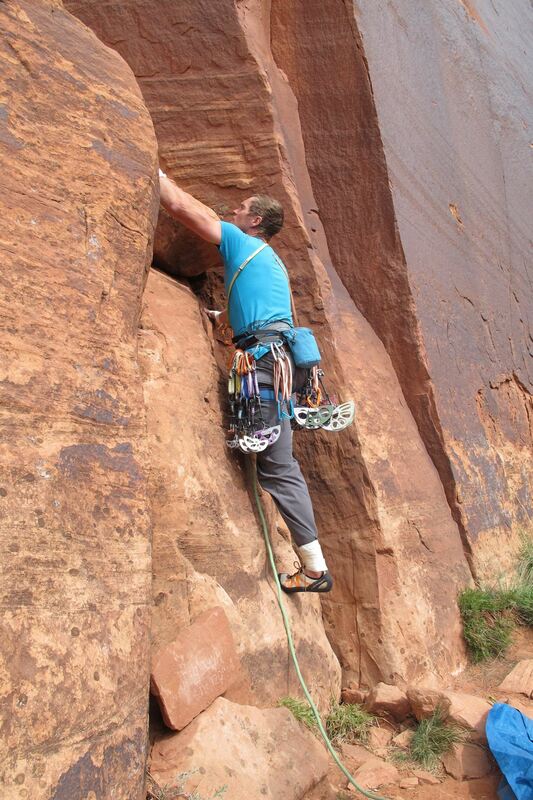 Always belay at the base of the offwidth.